On Sunday 9th December, 2018 – 31,700 Australian Bass Fingerlings and 1,000 Mary River Cod were released into Lake Samsonvale. The Mary River Cod fingerlings were released into the upper reaches of the North Pine River where the habitat should be more conducive to natural breeding. Since 1993 the PRFMA has released 30,780 Mary River Cod fingerlings into Lake Samsonvale as part of our conservation stocking program. The Fingerlings were supplied by Hanwood Fish Hatchery – Murgon – In an excellent condition. 36 Volunteers took part to ensure the success of the release. The outstanding efforts of the Volunteers will ensure a much greater survival rate for the Fingerlings than if they were all released in one spot. 22,000 Golden Perch fingerlings and 26,300 Australian Bass were released by PRFMA Members and BAS Permit Holders via the scatter method. OUR THANKS AND APPRECIATION GO TO ALL THOSE WHO PARTICIPATED IN A VERY SUCCESSFUL RELEASE. 31,300 Australian Bass Fingerlings were released into Lake Kurwongbah at Mick Hanfling Park on Wednesday 19/12/2018. The release was carried out by Members of the Pine Rivers Fish Management Association Members. The Fingerlings were supplied, in excellent condition and size, by Hanwood Fish Hatchery – Murgon. Stocking commenced in Lake Samsonvale in 1991 and has been routinely managed by the PFRMA to produce and first class fishing location offering a great variety of options for the novice angler right through to the experience veteran. 2 First year of stocking with funding available from PRFMA’s Boating Access Scheme. 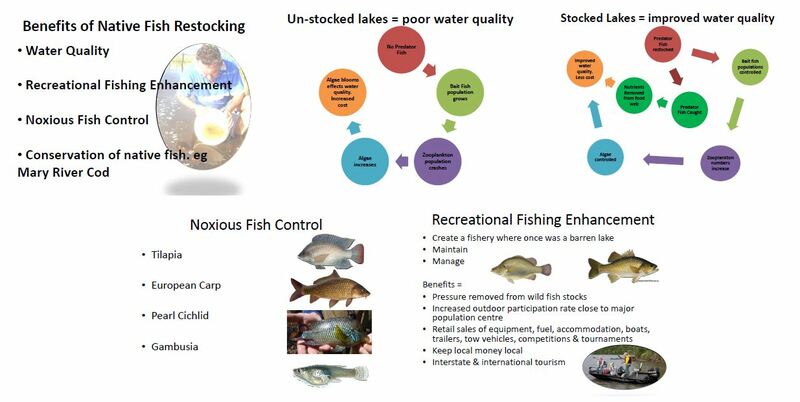 The fish stocking program for Lake Kurwongbah was able to be commenced after PRFMA successfully applied for and received funding from the Federal Department of Agriculture, Fisheries and Forestry’s recreational fishing community grants program. Moreton Bay Regional Council also contributed some initial funds and continues to supply funds each year to allow restocking of the lake. The focus for this lake will be to produce a Australian Bass, Golden Perch and Saratoga fishery. In 2008, PRFMA members made four trips to collect stock, the longest trip was over a thousand kilometers and required a couple of days of travel, harvesting and distribution to collect some prime southern strain Saratoga. Even though wet, tired and dirty our guys bought back the basis of a breeding population which we hope will make Kurwongbah a fine Saratoga fishery in the years to come.